Notes: Bought for the cover photo and the liner notes, this record is just full of songs built upon baby references. Here's a few choice words from the liner notes, "There are two kinds of babies. The first is small plump and damp; the second kind wears high heels, low lashes and walks as if she has sand in her shoes". "The boys with the flat tops and round sounds have been rockin' and swingin' the population with million-dollar vibrations and, at the same time, contributing to the American language such colorful expressions as "oo-shoop", "Sh-boom" and "ko ko mo". Need I say more folks? 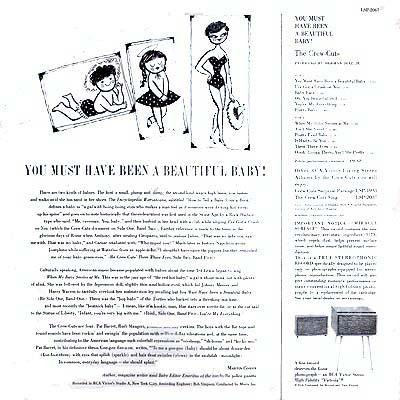 And if you look inot the lower right of the back cover you'll see that, "A fine record deserves the finest phonograph – an RCA Victor Stereo High Fidelity Victrola". Now go plop a platter onto the family Victrola and bop the night away.